Nanoscale, 2017, 2017, 9, 16128-16132. First published online 22 Sep 2017. 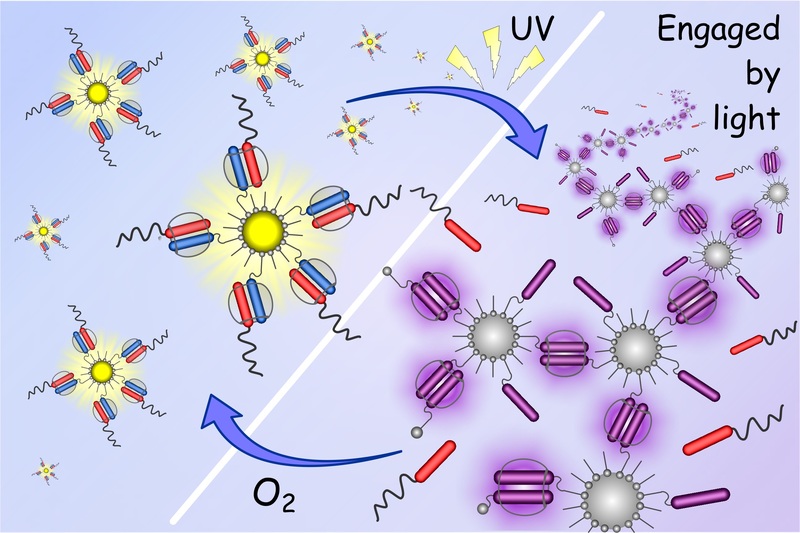 Herein, we show how the inherent light‑induced redox properties of semiconducting nanocrystals (NCs) can be utilized for the photo-driven reversible modulation of dynamic supramolecular systems formed at their interfaces that, on their own, do not respond to light. This was achieved by the unprecedented combination of photoactive zinc oxide NCs (ZnO NCs) with host‑guest chemistry of cucurbituril (CB) providing a route to semiconductor-assisted light‑modulation of supramolecular assemblies (SALSA), here mediated by photo‑generation of viologen radical cations (MV+•) at the NC corona and their further dimerization enhanced by CB macrocycles. The reported SALSA strategy was successfully applied for light‑controlled reversible assembly processes at NCs interfaces enabling light‑triggered release of guest molecules from surface confined discrete CB host‑guest complexes. We acknowledge the National Science Centre, Poland for the support within the Preludium 2015/17/N/ST5/03333 (A. Cieślak), and OPUS (J. Lewinski) projects.